1) Credit Program Speech Contest this week. Contestants should arrive at F-209 (next to the office) 10 minutes prior to your scheduled time. Please contact your teachers for your schedule. 2) Passport pick up this Sunday, 12 noon, in the office. 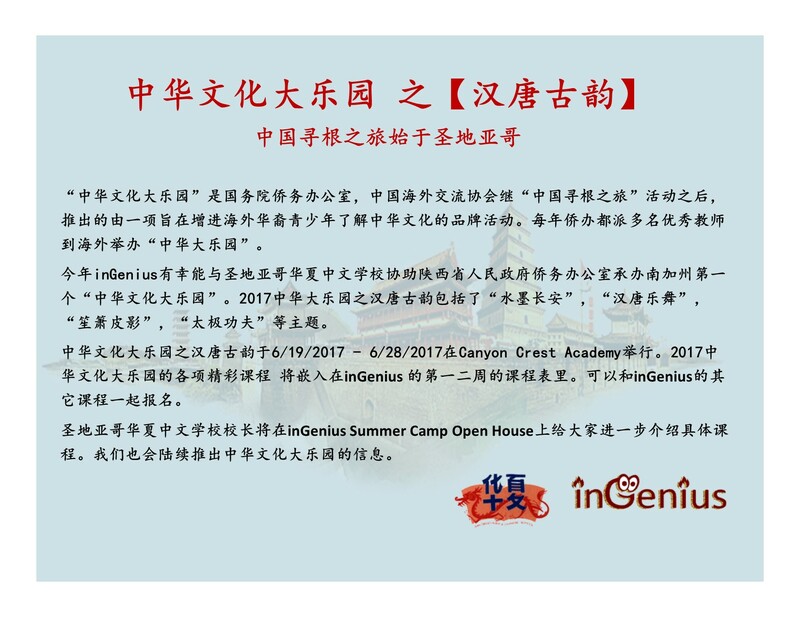 3) "Chinese Culture Land 中华大乐园" summer camp, 6/19 - 6/28, hosted by SDHXCS and inGenius. Flyers and course list attached. Click here https://ingenius.us for registration information. The courses: 仿唐乐舞，葫芦丝, 腰鼓，皮影，民歌，武术，书法，国画, all taught by professional instructors from China! Parents are invited to the final show on 6/28. Don't wait! Spaces are filling out fast! 4) Credit Program informational meeting is on April 9, 1:30 - 2:30, at S5-203. If your student is entering 7th grade or up in the Fall, she/he is eligible for credit program. 5) Credit Program Placement Test for current Hua Xia student is on April 23, 12 noon - 1:30, at I-101A.